I’ve got Disney on the brain! We’re taking the oldest for her birthday as she’s finally reached the specified Disneyland age of this family. We refuse to take the kids younger than we feel they’d have a good time...AND we’d have a good time. Let’s face it- we have no desire to waste almost $200 a day because of whining and naptimes. Since this is the absolute FIRST Disney experience for her, we’re doing the whole shebang- character dining and makeovers OH, MY! I’m more excited than she is at this point because she doesn’t really know what Disneyland is. Anyway, I’m making 2 princess dresses for her (one for each day) and I just finished the first. Say “hello” to Princess Sofia! This dress was a PAIN to make! Thank you Disney for making it harder and harder for mothers to please their daughters with unrealistic dress designs. Seriously, man! What’s good on paper isn’t always good in practice. Nevertheless, I came up with something that is pretty darn close. I started with the bodice of the Precious Dress (totally said that like Gollum) by Scientific Seamstress and then embellished the royalty out of it. 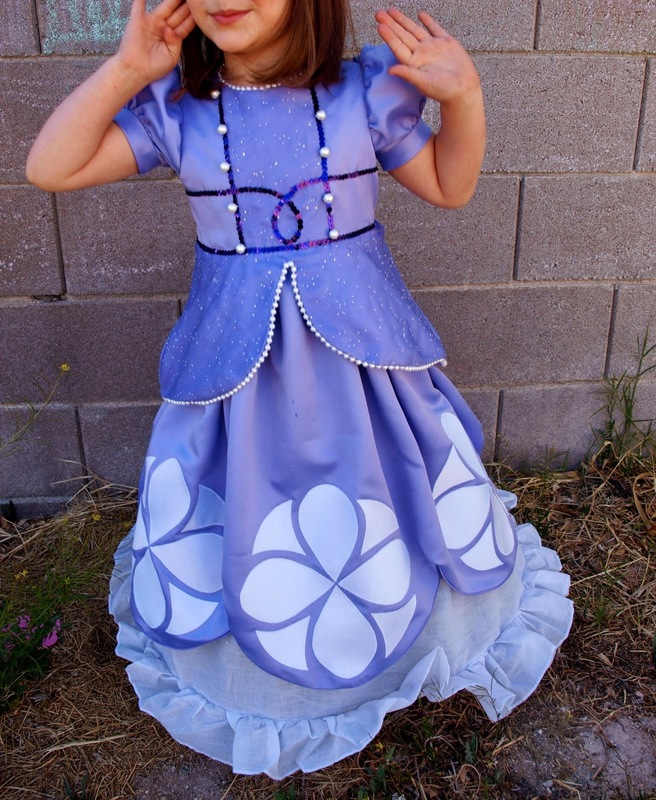 The purple sequins trim was first glued on using fabric glue and once dried, it was hand sewn on. The trim on satin kept slipping, so yeah, that was the only way to make it look nice. 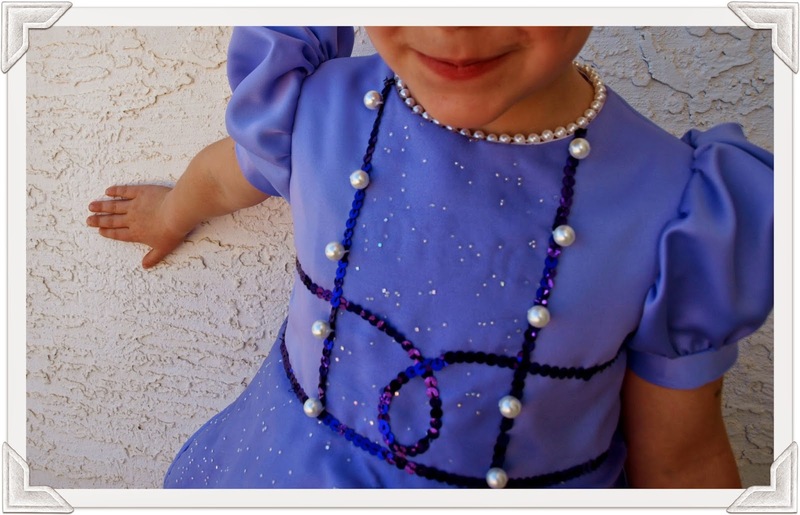 The pearls were also hand sewn as were the stringed pearls along the neckline (and peplum). Yes, it took forever. I drafted the peplum and skirt by myself because there isn’t a pattern like this...because no one wants to deal with Disney’s craziness. Well except me, of course. There are 48 appliques in all and I hated every one of them. They will now and forever be referred to as “CRAPliques” ok?. Funny story for those of you like “What’s the deal with that hoop skirt?” The sizing was from 2-5 and 6-8. Baby bug is tall and would soon be in a 6, so I went ahead and ordered a 6. It’s a drawstring and it wouldn’t bleeping stay UP! So I ended up making the drawstrings into straps and made her wear the skirt like a dress for half of these pictures. It works and that’s good for me! So if you were judging me, you can stop now. I know all about the weirdness. If you weren’t judging me...then I made you...then I stopped you. That was CLOSE. The following pictures INCLUDE the weirdness. 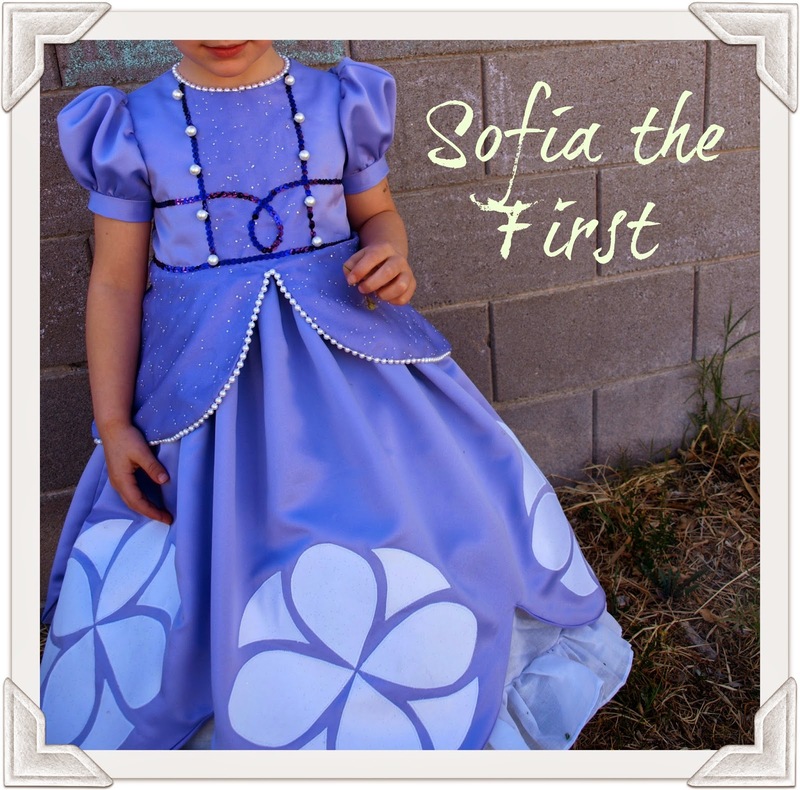 I hope you were a little inspired (or cautioned against) making a Sofia dress for your little one. In all seriousness, my princess was so thrilled that it really was all worth it. I’m not saying I’d do it again, but it was worth it THIS TIME. Good job! 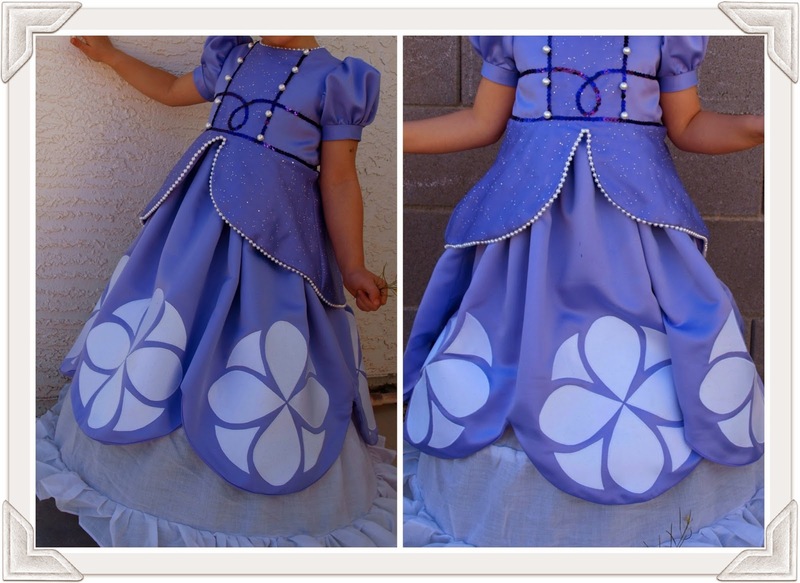 For future reference, candy castle patterns princess dress has the skirt like sofia's dress and heat transfer vinyl for the emblems saves sooooo much time! But that's what a first disney trip is all about right? We're going first week of May to Disney world and I could not be more excited! 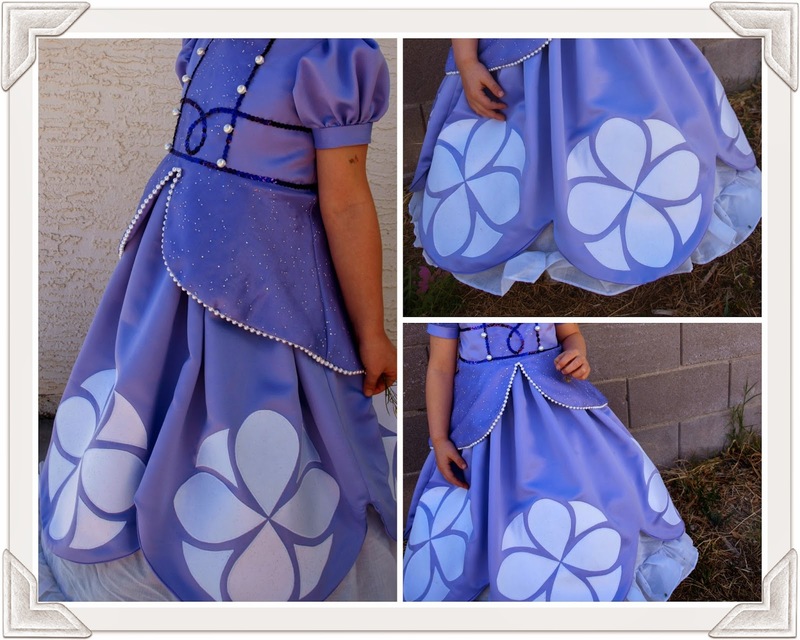 This princess dress is amazing! I bet she loves it. •Her name was Lola. She was a showgirl.